Often, we believe that our regular air conditioning system can deliver a steady flow of cool air, and it does. But server room cooling is different. 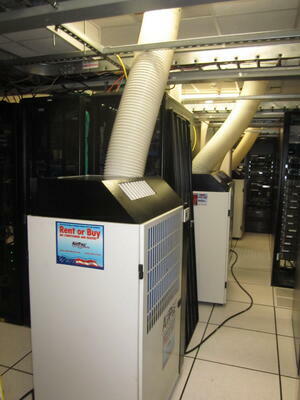 Server rooms need more cooling power to keep the temperature down and prevent the server from overheating. One of the biggest concerns of any company dependent on computers should be server room cooling and how to maintain the right temperature at all times. We all know that heat is bad when it comes to any server's life span. Losing a server due to overheating is a huge setback with a huge cost. The good news? Losing a server due to excessive heat is preventable! It’s possible that your building's AC may not be adequate in keeping a constant temperature in your server rooms. An alternative system should be put in place in case of an emergency or as a supplement to your existing cooling system. Technology experts believe the temperature range that is beneficial for a server room is between 64.4F and 80.6F. If your facility’s air conditioning system is not sufficient in keeping that temperature range in the server room additional units are necessary to keep your business running smoothly. Make sure to rent it through professionals who can analyze your specific situation and come up with an effective cooling plan for your server room. Avoid the temptation of running out to a big box store to pick up a couple of small portable AC units that are intended for residential cooling. There is a difference between residential and commercial portable air conditioners! Trust experienced professionals with a history in the business of keeping server rooms cool can recommend a plan with the right equipment. Don't risk seeing the blinking cursor and blank screen of a server blow out. Take the time invest in getting the right equipment for your server room. Few things are worse for any business than a total melt down of the computer system. Take a minute and contact us to find out what we can do to help keep your servers (and ultimately, your business) up and running.